Home » Collection » Peter Orlovsky (b. 1933 –) visiting his family — Lafcadio then age 47 had lived with us S.F – N.Y. 1955 – ’61 & intermittent years later on; Mother Katherine aged 78 totally deaf lip-reading some after botched mastoid operation N.Y. Eye & Ear Hospital 1933, drunken surgeon; Laff’s twin sister Maril who’d roomed with Peter & me East 2’nd Street Lower East Side 1959 while attending baby-nurse school in Jersey, later a half-dozen years she quit hospital job angry hearing other nurse voices’ “filthy gossip” she said about Me and My Brother, Robert Frank’s film on Orlovskys— all this two decades before this moment. From second floor flat on lonely Cottontail Road they needed taxi for any heavy shopping with monthly Social Service Indemnity checks at Supermarket a mile away in Center Moriches, Long Island. July 26, 1987. Peter Orlovsky (b. 1933 –) visiting his family — Lafcadio then age 47 had lived with us S.F – N.Y. 1955 – ’61 & intermittent years later on; Mother Katherine aged 78 totally deaf lip-reading some after botched mastoid operation N.Y. Eye & Ear Hospital 1933, drunken surgeon; Laff’s twin sister Maril who’d roomed with Peter & me East 2’nd Street Lower East Side 1959 while attending baby-nurse school in Jersey, later a half-dozen years she quit hospital job angry hearing other nurse voices’ “filthy gossip” she said about Me and My Brother, Robert Frank’s film on Orlovskys— all this two decades before this moment. From second floor flat on lonely Cottontail Road they needed taxi for any heavy shopping with monthly Social Service Indemnity checks at Supermarket a mile away in Center Moriches, Long Island. July 26, 1987. 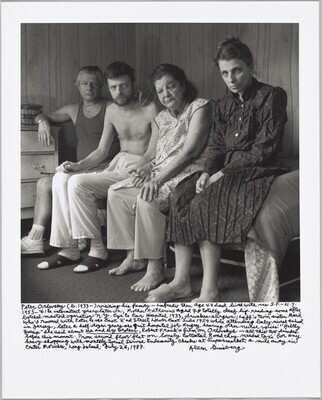 Beat Memories: The Photographs of Allen Ginsberg, National Gallery of Art, Washington; National Gallery of Art, Washington; Grey Art Gallery & Study Center, New York University, New York; The Contemporary Jewish Museum, San Francisco, 2010 - 2013, no. 79.